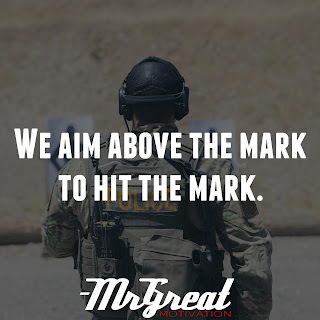 To hit the mark, it’s essential to aim above the mark. If you want to do the turnover of $1000 in your business this year, create a plan that allows you to do $100000 profit. To hit the mark you have to aim extraordinary! Do you aim high when setting your goals? Things seldom go exactly as you plan them, aiming allows you to hit the target with the inevitable occurs. We should know that goals must sit upon a solid foundation. In other words, your goals should move you closer to your dreams while honoring your core values and synthesizing with your great mission and vision statements. Goals should force you at least a little bit out of your comfort zone. A goal is not always meant to be reached; it often serves simply as something to aim at. Ninety-nine percent of people believe they can’t do great things, so they aim for mediocrity. Aim higher than you want to achieve and if you come in a little bit lower you've still done the very best that you can. Too many people seem to suffer mental problems if they aren't the absolute best at everything they try to achieve. Give yourselves a break and just do the best you can. Half the winning is in giving it a go! Go get it now. Stay Motivated.